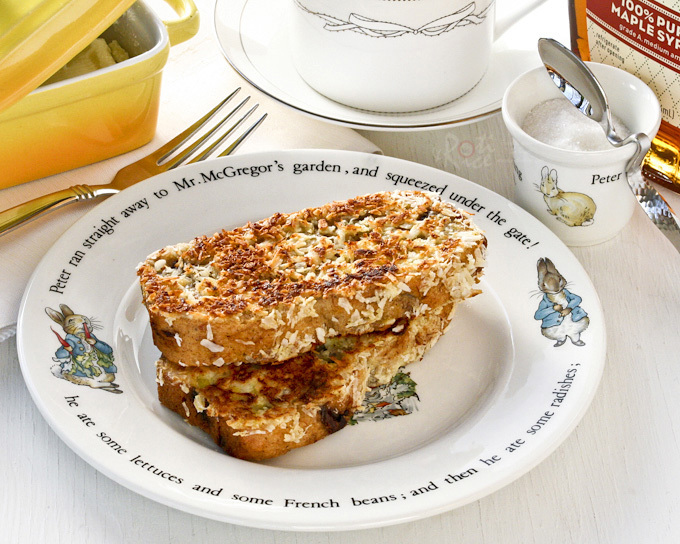 Make this Banana Bread French Toast for a weekend breakfast treat or dessert. It is so fragrant and delicious. You will not be disappointed! 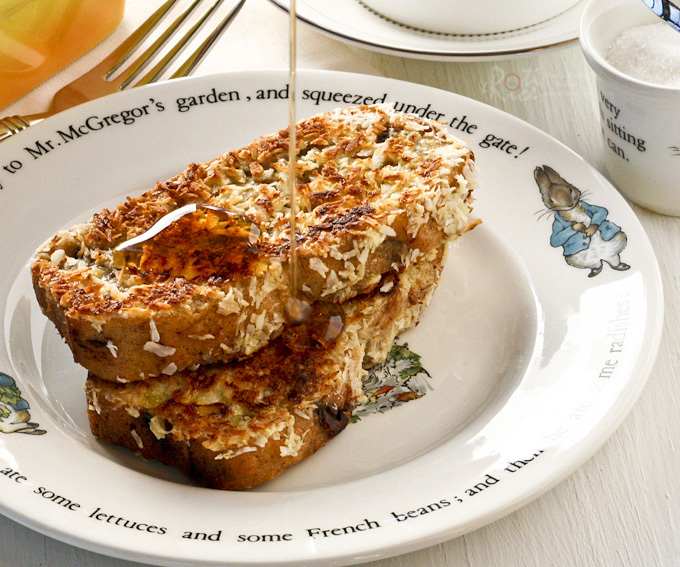 This Banana Bread French Toast is one special treat for a weekend breakfast or dessert. It is a must try if you happen to have left over banana bread. If not, make some using my Banana Nut Chocolate Chip Bread. Save it and pretend it is a leftover. 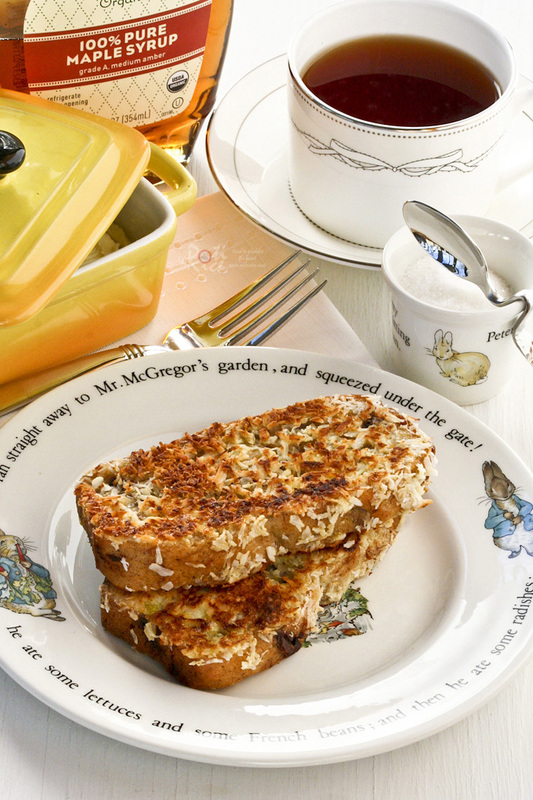 Then make this scrumptious Banana Bread French Toast. It is a winner and you will not be disappointed! I found the recipe from The King Arthur Flour Baker’s Companion – The All Purpose Baking Cookbook. The recipe calls for eggnog which I am not a fan of and so I substituted it with half-and-half (half milk and half cream). Instead of sweetened shredded coconut, I used unsweetened coconut as the banana bread itself was already quite sweet. Here is my adaption of the recipe. In a bowl, whisk together eggs, half-and-half, and nutmeg until smooth. Pour mixture into a shallow pan. Place slices of banana bread into the egg mixture. Allow the bread to soak up egg mixture for 30 seconds. Turn and do the same for the other side. Place grated coconut on a plate. Remove soaked bread from pan, place onto dessicated coconut. Turn and coat the other side. Heat butter in a large non-stick pan on medium heat. Transfer bread to pan and cook for about 2 to 3 minutes on each side. Serve immediately with maple syrup, if desired. NOTE: This post was updated on December 27th, 2012 with new pictures. No changes were made to the write-up or recipe. wow how creative! I bet they taste super delicious! Angie's Recipes – Thanks Angie. They are pretty delicious. Goes great with a cup of tea. What a great idea! I make my “soon to be world famous” banana bread whenever the kids are coming home. They usually take 2-3 loaves back to their homes/apartments and I’m stuck with 1/2+ loaf or so. I’ll try this recipe this morning, sans coconut. I’m the only one in the family that likes coconut.